Farin Bakhtiari ’14 (Psychology) graduated with a master’s degree in general experimental psychology with honors this year and received the 2016 CSUN Graduate Scholarship. Photo courtesy of Farin Bakhtiari. 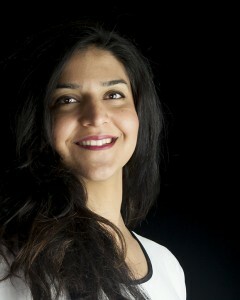 In 2010, Farin Bakhtiari ’14 (Psychology) and her family emigrated from Iran to the United States. She knew enough English to get along in her new country, but adjusting to a new culture while becoming the first person in her family to attend college placed multiple obstacles in her life — but they never kept her from pursuing her academic and personal goals. Bakhtiari was one of more than 11,000 graduates from California State University, Northridge this year, receiving a master’s degree in general experimental psychology with honors. During her undergraduate studies at CSUN, she volunteered for on-campus and off-campus community services. As a graduate student, Bakhtiari served as teaching assistant and participated in department research projects. To honor her persistence and diligence, the university awarded Bakhtiari the CSUN Graduate Scholarship for 2016. Bakhtiari said she appreciates the financial support and wants to give back to CSUN. While attending Pierce Community College from 2010-12, Bakhtiari took several courses in sociology and psychology. After consulting with her advisor, Bakhtiari decided to become a psychology major when she transferred to CSUN. In her first year at CSUN, Bakhtiari became a peer educator for CSUN’s Blues Project, an initiative for depression and suicide prevention. She completed 120 hours of training, gave presentations and educated college and university students about depression. “This experience opened my eyes to the importance of providing fact-based information about mental health, and how much difference these workshops can provide to individuals in need,” she said. Beyond her campus involvement, Bakhtiari contributed to local community services. She volunteered for the National Alliance on Mental Illness (NAMI), gaining firsthand experience with families affected by mental illness. “[It] made me more sensitive, understanding and realistic about mental illnesses,” she said. As an undergraduate student at CSUN, Bakhtiari became a teaching assistant for a junior-level research methods class. As a graduate student, she taught the statistics lab PSY320L, which sparked her passion for teaching. She also worked part-time as a student assistant in CSUN’s Department of Psychology and in the department’s psychology research office, working closely with students. For the past three years, Bakhtiari has worked on the department’s Adolescent and Adult Adjustment research project. She examined how neighborhood, family, peer and school climates related to adolescents’ and young adults’ academics and mental health. Bakhtiari was quickly promoted to assistant lab supervisor and then to lab supervisor. “Joining this lab was the most influential experience in my educational path, because it allowed me to discover my passion for conducting research,” she said. This fall, Bakhtiari will move on to the University of Texas at Austin to pursue a Ph.D. in human development and family sciences, aiming for a research-based teaching career.